“What and where is that?” My knowledge of Spanish—language and place names—was as limited as my knowledge of the state. For an answer, I got a knowing grin and a grunt. I gave myself over completely to the beauty of this landscape and did not care where we were going. Soon we saw a sign that told us that one-half mile to the right was the settlement called Ojo Caliente. On the surrounding hills and mesa tops were the ruins of prehistoric Indian dwellings. Indians had used the springs for curing their ills hundreds, yes, thousands, of years earlier. The scene that met our eyes was unforgettable. The clean, cool air floating down from the mountain was mingled with the strong odors of mineral waters. At the hotel desk, we learned that we could not even get a cabin for at least a week! We were amazed. What was here in this faraway place, where living conditions were evidently primitive, to call so many people and keep them? But facts are facts, so we drove around in front of the bathhouses, where people were gathered about an open well like so many insects sipping nectar from a flower. We joined the others. Looking down into the water, one could see tiny eruptions in the sand as the water came bubbling to the surface, hot and clear. This, we learned, was the lithia well. As we talked, we dipped our cups into the well and drank. At first we wondered how water could taste like that, but soon we found ourselves dipping in again and drinking with the others. The taste is one that grows. “What are you here for?” someone asked. I got more rest at Ojo Caliente than I had known there was in the world. I have been back there many times since that visit. Like the others, I never miss a chance to get the benefit of these healing waters. Each time I am there, I am surprised by the number of people, and the faraway places from whence they come. During the years, the facilities have been enlarged. A variety of accommodations are offered. Thousands of people visit the springs each year to enjoy the baths, to rest, or to revel in the beauty of the valley. They go home rested, happier. 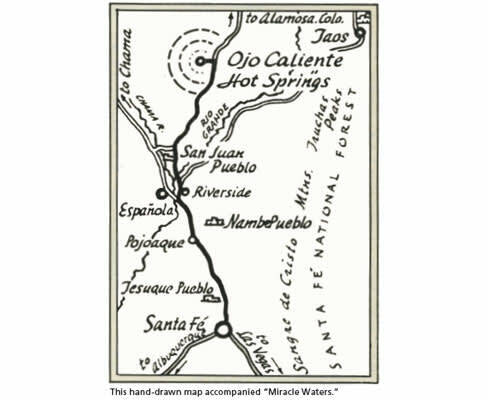 Many times, I talk with people who have never heard of Ojo Caliente. I hope they read this, then go there to see for themselves. Those who go are almost certain to go back. Strawcy Van Druff (1896–1985) Born in Topia, North Carolina, Van Druff moved to New Mexico in 1918. She taught in one-room schoolhouses in Union County until 1927, when she joined the faculty of the Clayton Public Schools. She retired in 1947, and in 1976 was named to the New Mexico Teachers Hall of Fame. A former society-page editor for the Union County Leader weekly newspaper, Van Druff was also an active member of the New Mexico Federation of Women’s Clubs.